The Australian Intellectual Property Journal (ISSN: 1038-1635) examines important intellectual property law issues and developments within Australia and around the globe. Articles cover the whole range of intellectual property law issues including copyright, trade marks, patent law, industrial design and unfair competition, as well as legal issues implicated in the new computing, telecommunications, multi-media, and internet technologies. Contributors are acknowledged experts in the fields of intellectual property and technology law. Dr David J Brennan is a Visiting Academic at the University of Technology Sydney and currently teaches copyright law at Monash University. Formerly a professor of patent law at Oxford University, he specialises in the fields of patent and copyright law, with a particular focus on their connections with contracts, property, restitution, international and trade law. David served as General Editor from 2007 to 2012, prior to the current General Editor Professor David Lindsay taking on the role. David received his law degree from University of Melbourne in 1992 and completed his PhD from the same university in 2003. He has been involved in Australian copyright law reform activities for decades and is a consultant for Screenrights, a rights management organisation in Australia. Dr David Lindsay is an Associate Professor at Monash University, where he teaches copyright, intellectual property, cyberlaw and trusts. He is an expert in technology, copyright and privacy law and has written extensively on these topics, including his 2007 book, International Domain Name Law: ICANN and the UDRP (Hart, 2007). From 2007-2010 he was a co-author of the legal service, Lahore and Rothnie, Copyright and Designs (LexisNexis/Butterworths, 1996- ). Since 2008 he has been a member of the Media and Communications Committee of the Law Council of Australia and in 2011-2012 was a member of the Copyright Council Expert Group. He is currently a board member of the Australian Privacy Foundation and a member of the expert Advisory Committee for the ALRC reference on Copyright and the Digital Economy. His current research interests include digital copyright, privacy and social networking sites and intermediary liability. Professor Dianne Nicol is a professor of law at the University of Tasmania in Australia and director of the Centre for Law and Genetics (CLG), which is housed in the Law Faculty. The broad theme of the CLG’s research is the regulation of biotechnology, human genetics and genomics and stem cell technology. Dianne’s research at the CLG particularly focuses on the legal and social issues associated with the commercialisation of genetic knowledge and patenting of genetic inventions. She is also more broadly interested in a range of aspects of intellectual property law in her teaching and research. She has held a number of Australian Research Council (ARC) discovery grants and currently leads two ARC funded projects, one on the legal, research ethics and social issues associated with genomic data sharing and the other on the regulation of innovative health technologies. Dianne also holds the role of Chair of Academic Senate at the University of Tasmania. In 2012 Dianne was appointed to a three-member expert panel to review pharmaceutical patenting in Australia. She has also been a member of two principal committees of the Australian National Health and Medical Research Council, the Australian Health Ethics Committee and the Embryo Research Licensing Committee in the triennium from 2015 to 2018 and the Gene Technology Ethics and Community Consultative Committee of the Office of the Gene Technology Regulator from 2017 to 2018. She is a Fellow of the Australian Academy of Law. The latest Part of the Australian Intellectual Property Journal includes the following content: “Intellectual Property and the Business of Innovation” – Bill Ferris AC; “Australian Laws and Regulations on Regional Branding on Food and Wine Labels: Part 1” – Paula Caroline Zito; and “Dealing Fairly with Parody: How Literary Theory Can Inform Legal Definitions” – Sarah Hook. Thomson Reuters is delighted to announce the appointment of Professor Dianne Nicol as the new Co-General Editor for the Australian Intellectual Property Journal. Dianne is a professor of law and Chair of Academic Senate at the University of Tasmania, and is director of the Centre for Law and Genetics (CLG), which is housed in the Law Faculty. Dianne’s research at the CLG particularly focuses on the legal and social issues associated with the commercialisation of genetic knowledge and patenting of genetic inventions. In addition to being a member of the Australian Health Ethics Committee and the Embryo Research Licensing Committee at the Australian National Health and Medical Research Council from 2015 to 2018, she has also been involved in the Gene Technology Ethics and Community Consultative Committee of the Office of the Gene Technology Regulator. She is a fellow of the Australian Academy of Law. Thomson Reuters also warmly welcomes the return of Professor David Brennan as co-General Editor on AIPJ. David is a Visiting Academic at the University of Technology Sydney and currently teaches copyright law at Monash University. Formerly a professor of patent law at Oxford University, he specialises in the fields of patent and copyright law, with a particular focus on their connections with contracts, property, restitution, international and trade law. David served as General Editor from 2007 to 2012 prior to Professor David Lindsay taking on the role. 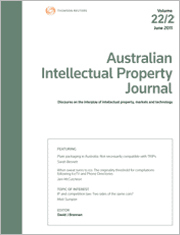 The latest Part of the Australian Intellectual Property Journal includes the following content: “Passing Off in the UK: A Normal Expansion or an Undue Extension?” – Mohammad Amin Naser; and “Critical Examination of the Concepts of Same Description and Closely Related in Australian Trade Marks Law: What are the Relevant Tests?” – Janice Luck. The latest Part of the Australian Intellectual Property Journal includes the following content: “The Copyright Tribunal as Exception-maker: Are Both Flexibility and Certainty Achievable?” – David J Brennan; “‘This Is a Complex Issue’: A Few More Questions about Fair Use” – Graeme Austin; and “Three Steps to a Safer Harbour in International Copyright Law” – Fiona Phillips. The latest Part of the Australian Intellectual Property Journal includes the following content: “Avoiding an Enforcement Free-for-All in Multi-Jurisdictional IP Disputes: The Case for an Organised System of Global IP Enforcement” – Michael Williams and Rebecca Smith; “Liability for ‘Invisible’ Use of Trade Marks on the Internet” – Vicki Huang; and “Gender (Im)balance in the Patent Attorney Profession in Australia: Myths and Evidence-based Recommendations for Change” – Dr Katherine Rock. The latest Part of the Australian Intellectual Property Journal includes the following content: “Patent Law and the March of Technology – Did the Productivity Commission Get It Right?” – Jane Nielsen and Dianne Nicol; “What Does a Good IP System Look Like? Good for Whom?” – Pippa Hall; it also includes a book review on “The Commercial Appropriation of Fame: A Cultural Analysis of the Right of Publicity and Passing Off” by Graeme W Austin. The latest Part of the Australian Intellectual Property Journal includes the following content: “The Multiple Dimensions of Intellectual Property Infringement in the 3D Printing Era” – Jane Nielsen and John Liddicoat; “E-Books and the Principle of Technological Neutrality: Should Public Lending Right Schemes Apply to E-Lending?” – Rita Matulionyte. The latest Part of the Australian Intellectual Property Journal includes the following content: “Enhanced Enforcement of IP Rights in Transnational Cases in Australia” – Richard Garnett; “The Protection of Origin Marks in China and Japan” – William van Caenegem, Jen Cleary and Lucie Treguier; “China’s Copyright Public Domain: A Comparison with Australia” – Yahong Li and Graham Greenleaf.